After leading the Ryerson Library and Archives (RULA) through a decade of transformation, Madeleine Lefebvre is stepping down as Chief Librarian. When Madeleine arrived at Ryerson University for the first of two five-year terms, the library was on the cusp of evolutionary change. During Madeleine’s tenure, innovative services and technologies put RULA at the forefront of support for digital literacy, e-learning and entrepreneurial skill development at academic university libraries. Madeleine’s vision took the library beyond existing boundaries – physically, intellectually and creatively. Her role in the conceptualization, design and development of the award-winning Student Learning Centre enhanced technology-enabled learning at Ryerson. Madeleine encouraged digital innovation at RULA and Ryerson by supporting opportunities to move beyond traditional information management to participate in the creation, mobilization and sharing of knowledge. RULA embarked on numerous academic collaborations that have included the augmented-reality app created in conjunction with the Discover St. Clair website (http://apps.library.ryerson.ca/stclair/) and a partnership with the Ryerson Image Centre in unveiling the real-life inspiration of Winnie the Pooh (http://therealwinnie.ryerson.ca/). Other partnerships under Madeleine’s guidance have resulted in initiatives with significant impact for student and faculty academic success, including the highly popular One Stop Course Readings and open access publishing. With the opening in 2015 of the library’s Isaac Olowolafe Jr. Digital Media Experience Lab, and the brand new Ryerson Library Collaboratory, RULA has come to play an important role in promoting digital literacy and supporting technology in learning and teaching. Madeleine’s vision is now RULA’s continuing legacy. Madeleine will be on post admin leave until January 10, 2019, when she will return to the Library in another capacity. Ryerson University Library and Archives (RULA) presents the following list of Top Ten Films from the library’s AV collection titled School on Film. Visit the library’s Audio-Visual (Media) Resources & Services page to learn more about AV services and collections available through RULA, including offering suggestions for new AV titles to enhance the collection. We’re hiring! RULA invites applications with a strong commitment to client service to fill a permanent career status position as a Business Liaison Librarian. For more information about the position, or to apply, please see the Ryerson Careers & Jobs posting. 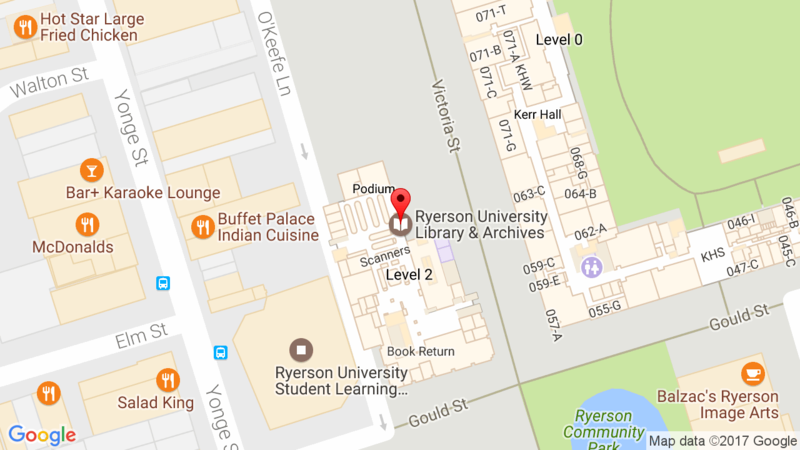 Students interested in working at the Ryerson Library should visit our Students Job page. Ryerson University Library & Archives (RULA) is part of a cross-functional team at Ryerson University that will manage the development of the open source technology platform to provide the Open Textbook Library, an open publishing infrastructure system for the province of Ontario designed to enhance and expand eCampusOntario’s Open Textbook Library. This eCampusOntario Open Textbook Library, developed and shared by BCcampus provides access to over 180 high-quality, academically reviewed textbooks and open education resources (OER) for Ontario post-secondary students. RULA is involved with managing the project goals of creating a repository and authoring system for open textbooks, and other open content. More information can be found on the Infrastructure For Open Publishing of Curriculum Resources Project website. 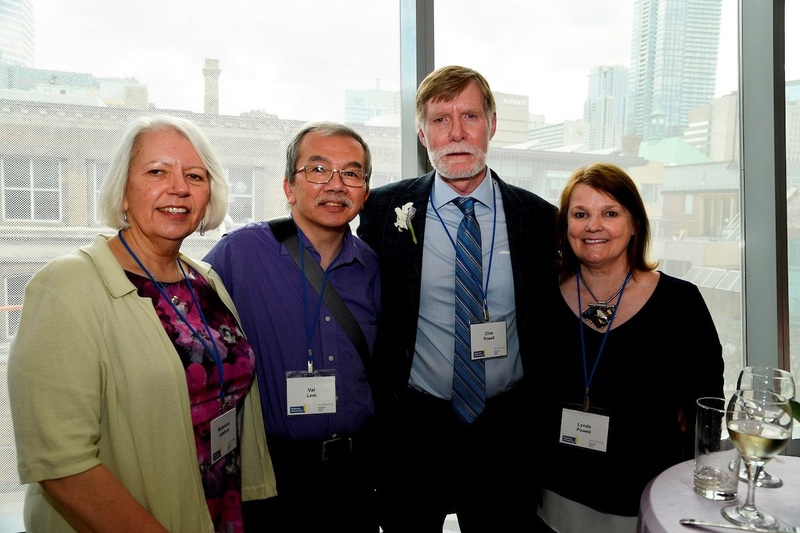 Clive Powell, who was instrumental in bringing The McGraw-Hill Ryerson Press Collection to the Ryerson Library and Archives, was recently awarded an inaugural G. Raymond Chang Outstanding Volunteer Award in recognition of his role. As a retired McGraw-Hill senior executive, Clive has dedicated himself since 2011 to documenting the Ryerson Press Collection, acquired by McGraw-Hill through its purchase of Ryerson Press in 1971. The collection, which includes almost 3000 book titles and more than 2000 related archival documents, has been donated to the Special Collections unit of Ryerson Library and Archives. Clive has conducted extensive research into various aspects of the collection, has produced a video and writes a blog. Clive presented a paper about his work on the collection at the 2017 Congress of the Humanities and Social Sciences on May 30 at Ryerson University. He was one of four presenters in a joint session of the Bibliographical Society of Canada and the Canadian Association for the Study of Book Culture. His talk, The Ryerson Press: An Enduring Legacy, was part of a panel on Writing, Printing and Publishing for Markets at Home and Abroad. The first annual G. Raymond Chang Outstanding Volunteer Awards program was launched to recognize the many ways that volunteers contribute to life and learning at Ryerson University. The awards are named in honour of the late G. Raymond Chang, former chancellor of Ryerson University, for his deep belief in the importance of volunteering. Congratulations to our graduating student employees! Congratulations to our graduating student employees! The Library annually recognizes their contributions by giving them the opportunity to suggest items to add to the collection. The items selected by the students have been purchased and are now available at the Library, with a mention of the contributors in the catalogue records, as well as in each of the chosen items themselves. 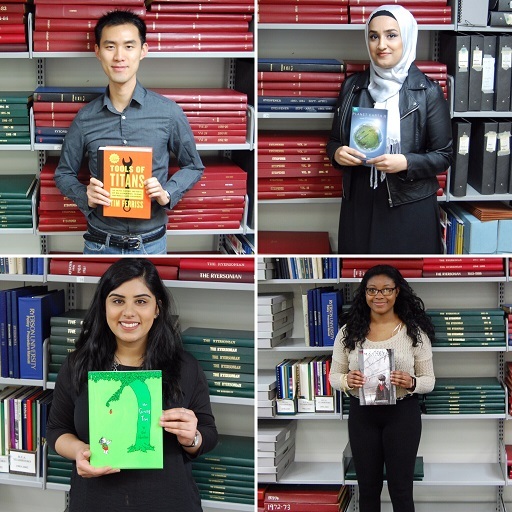 In the photo, recent graduates Charles Ko (upper left), Maham Hijazi (upper right), Zobia Qureshi (lower left) and Monique Aaron (lower right) display their requested titles, now part of the Library collection. Requested titles include Tools of Titans (2016), X-Men: Magneto Testament (2015), Planet Earth II (2017), The Giving Tree (1992).